George Crumb is not part of my usual listening fare. No real reason: I have just never got around to hearing his music. Based on the seven pieces from his Eine kleine Mitternachtmusik (A Little Midnight Music) it is a situation that I may have to review. Crumb is regarded as an avant-garde composer, who creates his often-beautiful sound-world by way of unusual sonorities and extended playing techniques. On the present discs, these pieces act as a continuous thread through the sequence of American ‘nocturnes.’ The inspiration for this music came from Thelonious Monk’s ‘Round Midnight’ written in 1944. Crumb effectively deconstructs the theme and provides simultaneously a commentary and meditation on it. All the ‘advanced’ pianistic techniques are used: strumming and plucking of strings inside the instrument, tapping the piano’s woodwork with the fingers and the ironwork with a padded stick. It is played on an amplified piano. The nine movements of Crumb’s Eine kleine Mitternachtmusik are 1. Nocturnal Theme; 2. Charade; 3. Premonition; 4. Cobweb and Peaseblossom (Scherzo); 5. Incantation; 6. Golliwog Revisited; 7. Blues in the Night; 8. Cadenza with Tolling Bells; 9. Midnight Transformation. Cecile Licad omits movements 6 and 8. All these pieces conjure up a vivid nocturnal mood that can be variously unsettling, eerie, scary and quite delicious. More romantic fare is provided by Amy Beach, ‘the first great American-born female composer’ whose Hermit Thrush Pieces, op.92 were written in 1921. These two numbers – ‘A Hermit Thrush at Eve’ and ‘A Hermit Thrush at Morn’ have their inspiration in poems by the American poet John Vance Chaney and the British John Clare. Both pieces are a kind of crossover between Chopin and French Impressionism, seen through the ears of Edward MacDowell. The Hermit Thrush is a native American bird which has fascinated many poets, writers and musicians over the years. The other piece by Beach is the evocative ‘Dreaming’ from her Four Sketches (1892). This is prefaced with a quote from Victor Hugo: Tu me parles du fond d'un rêve – ‘You speak to me from the depth of a dream…’ The music is suitably surreal in its elusive pianism. Charles Griffes was influenced (amongst others) by Debussy, Scriabin and elements of Asian music. The present Nocturne (1915) is largely impressionistic in its mood, although there is some ‘high-romanticism’ in these pages. The composer even indulges in a little polytonality on occasion (two- or more - keys at once!). Griffes’s other offering is ‘Night Winds’ from Three Tone Pictures, op.5 (1911/15). This is another manifestly impressionistic piece complete with whole tone scales and harmonies. It is based on a poem, ‘The Lake’, by Edgar Allan Poe and has been described as ‘a shimmering spray of notes’ (Michael Lewin). Louis Gottschalk’s ‘La chûte des feuilles’, Nocturne, op. 42 was composed in 1860 whilst the composer was in Havana, Cuba. It is based on an original Cuban melody by Nicolás Ruiz Espadero (1832-1890). Yet the reality is that this work epitomises the French salon of mid-century Paris. A distinctive feature is the powerful middle section of the piece. Something a little more sinister is found in Daniel Gregory Mason’s ‘Night Wind’, op.9, no.6. This piece, composed in 1913, is highly derivative of Franz Liszt’s virtuosic pianism, with its ‘evocation of a stormy night.’ It is the last number of his suite Country Pictures. The liner notes enjoin the listener lookout for Mason’s use of the whole-tone scale (C, D, F# G# & A# etc.) in two Debussy-inspired sections of this work. It is an impressive piece. Ernest Bloch was born in Switzerland, but emigrated to the USA in 1917. The notes explain that as he did not take American citizenship until 1924, so In the Night: A Love Poem (1922), may not qualify for inclusion on this disc. However, I feel that this dark, lugubrious piece, with its ‘euphonious’ dissonance and nods to impressionism deserves it place in this collection. Everyone knows Samuel Barber’s Adagio for strings and his Violin Concerto, but I wonder how many have explored his fascinating piano music. Best-known (where known) are his Piano Sonata, op.26 and the jazz-infused Excursions, op.20. The present Nocturne, op. 33: Homage to John Field is standalone and was written during 1959. It pays tribute more to Chopin than the Irish John Field. Whatever the motivation, Barber does not try to write pastiche music of either composer: there is even a nod to a 12-note tone row in this music. It is very much in Barber’s ‘20th century’ style. 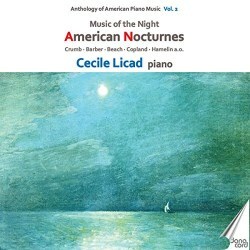 It was inevitable that Aaron Copland’s Night Thoughts: Homage to Ives was included on this double CD of Nocturnes. Apart from the Crumb pieces, this is the most modern work in the collection. It was written as a test piece for the 1973 Van Cliburn International Piano Competition which was held at Fort Worth, Texas. Although this is not a hugely virtuosic piece, it is a challenging exploration of serial writing, more traditional resources and considerable dissonance. It is basically slow throughout with variety being provided by the deployment of textures. For listeners who think of Copland in terms of ‘Hoe-Downs’, ‘Appalachian Springs’ and ‘Fanfares for Common Men’ it will come as something of a culture shock. I was impressed by Leo Ornstein’s Nocturne no.2. As the notes point out, Ornstein was regarded as the ‘wild man of music’ during the late 1910s and early 1920s. His music was characterised by ‘extreme (then) dissonance’ and for the composer’s ‘savage performances’ of his own music. Witness the present work. It is more a nightmare than an evening reverie, although there are some restful moments. The music is horrendously complex to read and difficult to play. It is given a stunning performance by Cecile Licad. Canadian pianist Marc-André Hamelin has contributed a Little Nocturne, which is timeless in its stylistic parameters. This near-perfect piece was composed in the city of Boston in 2007. So, it is (in effect) an American work! George Whitefield Chadwick was one of the ‘Boston Six’: the others were Amy Beach, Arthur Foote, Edward MacDowell, John Knowles Paine and Horatio Parker. Their mission was the Americanisation of European music. Chadwick’s Nocturne is a ‘late successor’ to Chopin’s genre, although note the ‘habanera-like’ rhythm played by the pianist’s left hand. A lovely piece. The Nocturne, op.6 no.2 by Arthur Foote is entirely European in its mood and effect. The liner notes suggest that this is odd, as Foote is regarded as being the first ‘significant American composer who was entirely USA trained.’ Boundaries of land and sea matter little when the music is as attractive and moving as this piece is. Ferde Grofé is best recalled as the person who orchestrated George Gershwin’s Rhapsody in Blue for the Paul Whiteman band. Which is a pity. Grofé wrote several fine orchestral suites, the most famous being the Grand Canyon Suite. Other Suites include the Hudson River, Madison Square Garden and the Niagara Falls. The Nocturne was originally written for orchestra and the present arrangement is by Domenico Salvino. The music is presented in ternary form with a central blues section framed by dream-like music and an impressively strong coda. Grofé uses exotic scales and subtle harmonies to create this all-American Nocturne. I enjoyed Joseph Lamb’s clever Nightingale Rag. Associated with the other great ragtime composers, Scott Joplin and James Scott, Lamb gave up composing when ragtime began to be overtaken by jazz in the years following the First World War. This present rag is quiet and delicately nuanced. Arthur Farwell’s 1905-piece Dawn, op.12 is influenced by melodies from the Nebraska Omaha tribe of native American Indians. It nods to Edward MacDowell’s earlier ‘Indianist’ essays. There is a delightfully unfocussed feel to this music. The Nocturne (Ragusa) by Ernest Schelling has little to do with the USA. Ragusa may refer to a city in Sicily. It is also the historical name for the wonderful Croatian town of Dubrovnik. The score is prefaced with lines from a poem: ‘Chapels of the Dalmatian Coast/Half hidden in the rugged heights/Send out a silvery vesper call/Ragusa of haunting charm…’ This is an evocative piece, that will immediately appeal to anyone who has seen this part of the world. The music owes much to Debussy, but is sultrier in its mood. The playing by Cecile Licad is impeccable. She is absolute master of these diverse styles. Her superb playing is complemented by the excellent recording by Danacord as well as the readable liner notes by Jeremy Nicholas and an introduction from Thomas Nickelsen. I reviewed the first volume of this anthology of American Piano Music back in 2016. This included Sonatas by Alexander Reinagle, Elie Siegmeister, Edward MacDowell and Charles T. Griffes. This series from Danacord is designed to reveal ‘the stylistic breadth, high musical quality and great originality of the best American piano works.’ This second volume is a worthy successor to the first. I do recommend listening to the tracks a few at a time to get the most out of this exploration. I look forward to the next volume (American Landscapes, 2018) in the series with considerable interest and much impatience.